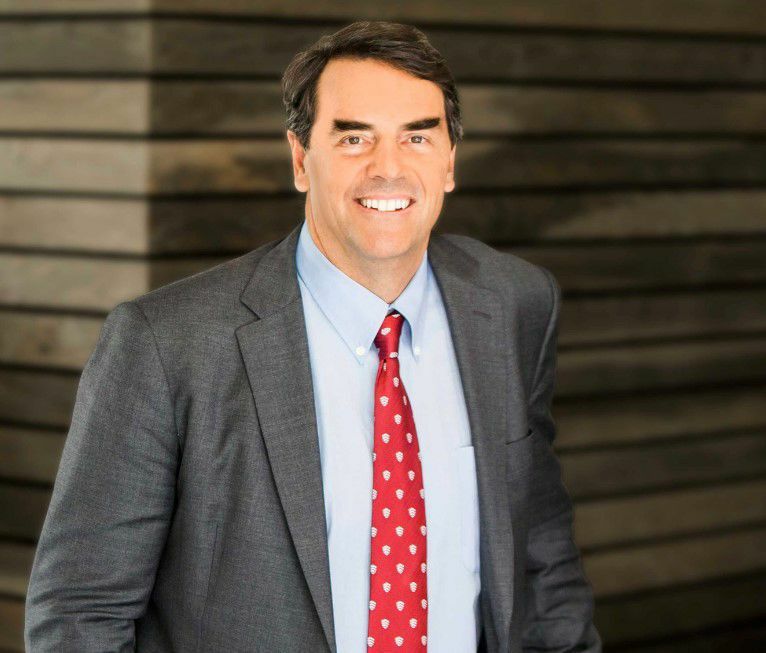 Venture capitalist Tim Draper who is helping spearhead the movement to split California into three states spent the first 18 months of his life with his parents in East Chicago's Sunnyside neighborhood. His father was in a management training program at then-Inland Steel Co. in East Chicago. Baby sitter Barbara Tonkovich, now Whitaker, now a Munster resident, and her charges, Rebecca and Polly Draper, when they lived in East Chicago's Sunnyside neighborhood in July 1956. Rebecca and Polly are the older sisters of venture capitalist Tim Draper, who is spearheading a campaign to separate California into three states. Pictured are Phyllis and William Draper and their two daughters, Polly, in her mother's arms, and Rebecca, in July 1956, when they lived in East Chicago's Sunnyside neighborhood. Third child, Tim Draper, not yet born, lived there for 18 months before the family moved to Palo Alto, California. Tim Draper is a venture capitalist who is helping spearhead a campaign to break up California into three states. Phyllis Draper, mother of California venture capitalist Tim Draper, poses with daughter, Rebecca, and the family dachshund, Kringle, for a story in the Hammond Times in August 1954. An article that appeared in the Hammond Times in August 1954, on the Draper family who lived in East Chicago's Sunnyside neighborhood, talked about how welcome they felt after moving there from Boston. Venture capitalist Tim Draper, who lived there for the first 18 months of his life, is helping spearhead the movement to split California into three states. Tim Draper, the 60-year-old billionaire venture capitalist who proposes splitting California into three states, began life in East Chicago, contrary to many biographies written about him. He joined his sisters, Rebecca and Polly, in the townhome in the Sunnyside neighborhood of East Chicago, where the family lived for approximately another 18 months before moving to Palo Alto, California. Originally from New York City, Phyllis and William Draper and their daughter, Rebecca, arrived in East Chicago in the summer of 1954 after William Draper completed graduate work at the Harvard University School of Business. A graduate of Yale University, he joined a management program offered by East Chicago-based Inland Steel Co.
Phyllis Draper, a graduate of Smith College, and Rebecca appeared in a Hammond Times article dated Sunday, Aug. 15, 1954. “Mrs. William Draper has found that baby sitters are few and far between since she and her husband moved to the Calumet Region with their 5-month-old daughter, Rebecca Starr, about a month ago,” reads the article by Woman’s Page Writer Frances Doyle. “She appreciates, however, that their home at 2608 140th Pl, in the Sunnyside section of East Chicago, has a yard for the baby and the family’s pet dachshund, Kringle,” Doyle wrote. The problem of finding a baby sitter eventually was solved when the Drapers met Barbara Tonkovich, a pre-teen who lived in the neighboring townhome. “I baby-sat the toddler, Becky, and then the baby, Polly, after she was born,” recalls Barbara Tonkovich Whitaker, of Munster, a retired East Chicago elementary school teacher. That job earned her 50 cents an hour, Whitaker said. The Draper family also introduced her to a summer fashion unknown to the Tonkovich family. “They bought me my first pair of Bermuda shorts,” Whitaker said with a chuckle. When the Draper family moved to Palo Alto, Whitaker said she lost track of them, until she read a magazine article. “There was an article about Polly Draper who was an actress in a program called ‘Thirtysomething,’ ” Whitaker said about the popular ABC TV drama for which Polly Draper received an Emmy nomination in 1987. Tim Draper said he was too young to have memories of living in East Chicago, but said he’s heard plenty of stories. His father, William Henry Draper III, “always referred back to the Inland Steel experience as a real good management program,” Tim Draper said. “My grandfather (William Henry Draper Jr.) was the first venture capitalist. He was friends with Ed Johnson and the two of them started Draper & Johnson Investment Co. in California,” he said. Asked why he wants to voters to divide California into three states in November, Tim Draper said he’s seen California sink to bottom rankings in multiple areas. “I’ve seen California go from being first in education to 46th/47th in the nation,” Draper said, adding that the quality of life in the state has bottomed out. “We went from first to 50th, from the best to worst place to do business,” he said. Money spent by California lawmakers on infrastructure has gone from 28 percent of the state’s budget to 3 percent, Tim Draper said. “We have bad water, bad potholes,” he said.